Matt and my dad caught a mahi mahi in Playa del Carmen, and I prepared it two ways - as Ceviche (cold salad with tortilla chips) and grilled (see previous post). Delicious! Mix all the ingredients allow to marinate at least 1-2 hrs. Drain off excess juice and refrigerate. Good for 3 days maximum. Discard leftover after 3 days. I made this on our trip to Playa del Carmen, Mexico. Combine orange, red pepper, scallions, red onion, jalepeno, and cilantro. Add orange juice, syrup, tequila, lime juice, and olive oil. Season, to taste, with salt and pepper. Grill the fish fillets for 4 minutes on each side and top with salsa. 1.) Boil lobster tails for 8 to 10 minutes in salted water (until shells curl and lobster meat turns white). Drain, transfer to a cutting board, and cool for 15 minutes. Using kitchen shears or a sharp knife, cut through the top shell lengthwise. Remove the meat and cut into 1/2-inch pieces. Set aside. 2.) Meanwhile, bring the chicken stock to a boil in a pan and keep hot over low heat. Keep a ladle handy. 3.) Melt 3 Tbsp butter in large pot over medium heat. Cook butter 1 to 1 1/2 minutes. Add onion; cook 3 minutes. Add garlic and rice, stirring to coat with the rice with the butter. Add brandy, simmer until the liquid has almost evaporated (3 minutes). Add 1/2 cup of hot stock and stir until almost completely absorbed, about 2 minutes. Continue adding stock, 1/2 cup at a time, stirring constantly and allowing to absorb before adding the next. This process should take about 20 minutes and rice should be "al dente." Remove from heat. 4.) Stir in Parmesan, 1Tbsp butter, chives, and salt/pepper to taste. Transfer to a serving bowl. Arrange the lobster meat on top of the risotto and garnish with the remaining chives. I was sitting in the chiropractor's office reading magazines and came across this recipe. It looked really good and easy, too! Place the salmon on a baking tray and sprinkle 1 Tbsp of sesame oil and the brown sugar over the top of each. Place under broiler for 6-7 minutes until brown. Meanwhile, cook the udon noodles in boiling water for just a few minutes and drain. Place in a mixing bowl with the remaining sesame oil, hot sesame oil, shallots, scallions and soy sauce; mix well. Blanch the spinach for a few minutes until wilted; drain. Serve salmon on top of noodles and spinach. Drizzle with any remaining sauce. Adapted from a recipe by Daniel Green in Edina magazine. I made this last night and it was amazing. I served it with good quality tortilla chips and homemade guacamole. Pre-heat grill to medium-high. Cut 6 pieces of aluminum foil, approximately 12"; spray each piece with cooking spray. Combine jalapenos, garlic, olive oil, jerk seasoning, lemon juice, salt and pepper in a container with a tight-fitting lid; shake well to combine. Coat each tilapia filet with this mixture, and place one on each piece of foil. Combine onion, red pepper and cilantro; place a spoonful on top of each fish filet. Gently fold over the foil to seal into packets. Grill for about 15 minutes or until fish is cooked through. Let stand 5 minutes before serving. Make Ahead Tip: Prepare through Step 2 and refrigerate for up to 4 hours. Kitchen Tip: A nonreactive bowl or pan—stainless-steel, enamel-coated or glass—is necessary when cooking with acidic foods, such as lemon, to prevent the food from reacting with the pan. Reactive pans, such as aluminum and cast-iron, can impart an off color and/or off flavor. Per serving: 189 calories; 12 g fat (2 g sat, 8 g mono); 86 mg cholesterol; 9 g carbohydrates; 0 g added sugars; 13 g protein; 2 g fiber; 229 mg sodium; 394 mg potassium. Bring large pot of water to boil over high heat. Add pasta and cook until al dente. Drain and keep warm. Meanwhile, place cream in a small pot over high heat and bring to the boil. Continue boiling until reduced to 1 1/2 cups. Heat butter in a large pot over medium heat. Add seafood and garlic. (If using cooked fish, add after step 4.) Cook fish until almost done. Add tomatoes and wine. Reduce heat and simmer for 2 minutes to finish cooking seafood. Remove fish with a slotted spoon and set aside to keep warm. Add cream to juices in pan, and raise heat to high. Cook until thickened - about 3 to 5 minutes. Gently stir noodles into sauce. Gently stir in cooked seafood, onions, cheese, salt and pepper. Serve immediately. Recipe from the Fiddlehead Restaurant. I served this with my lemony pesto fusilli. Pre-heat oven broiler to high. Season fillets with salt and pepper. Place on foil-lined sheet pan. Broil fish 6 minutes and then drizzle with a light coating of lemon-infused olive oil. Continue broiling until the fish until just barely cooked through and it flakes apart when gently prodded with a fork (total time 8-10 minutes). Do not overcook. Remove fish to a warm plate and serve immediately. This is a great recipe – and so easy to prepare. It was inspired by a method recommended by Coastal Seafoods. The fish comes out extremely moist and flavorful. My husband claimed it was the best fish he has ever eaten! Rainbow trout has a nice, flaky texture and delicate flavor. Cooking it with the skin on adds flavor and helps hold the meat together. The skin is edible if you like to eat it. Cut slits at a 45-degree angle across the skin of the fish, about 1.5” apart. Open fish to expose fillets, and spread mustard evenly on surface. Top with garlic and herbs. Drizzle half of the olive oil in a shallow pan or rimmed cookie sheet. Place the stuffed fish on the pan and drizzle with the remaining olive oil and fish stock. This has a lot of ingredients, but it is easier than it looks and you can vary the ingredients to your liking. The chorizo is optional, but it really adds great flavor. If you only have one color of bell peppers, just use that. If you don't have any dry sherry on hand, omit it. Chicken broth or vegetable broth may be substituted for the fish broth. The type of fish can be any combination that you prefer. Heat the olive oil in a paella pan (wide round pan) over medium heat. Add the chorizo, garlic, onions, tomato, and bell peppers. Cook, stirring constantly, for about 6 minutes. Season with salt and pepper. Add the rice and cook for about 5 minutes, stirring constantly. Add the sherry and continue to stir until the it evaporates. Add the fish broth, squid, and spices (paprika through saffron). Cook for 15 minutes. Add the fish chunks and cook for 5 minutes. Add the scallops, shrimp, peas and capers. Combine well and continue cooking for 5-10 minutes or until the rice is tender, the fish is just cooked through, and the broth has been absorbed. Garnish with lemon wedges and serve straight from the pan. I was craving seared rare tuna steaks for Valentine's Day, so I made up this recipe. It was delicious, and the lovely pink tuna steak is the perfect color for the holiday. If you have never had Israeli Couscous before, I highly recommend it as a side dish for its ease of preparation. The tomato and avocado salad pairs perfectly with the tuna. Place tuna steaks in a zip-top bag or non-reactive container. Whisk together soy sauce, tamarind concentrate, ginger, sugar or honey, garlic, sesame seeds, red pepper flakes, and lime zest. Marinate for 20 to 30 minutes. Heat peanut oil and sesame oil in large, heavy skillet over medium-high heat until almost smoking. Remove each tuna steak from marinade, but keep as much ginger and sesame seeds as possible clinging to the tuna steaks. Sear tuna steaks for 2 minutes per side for rare - it should be very pink and cool inside, but with a dark golden crust on the outside. Remove to a warm plate and allow to stand for a minute or so, and then serve. I served this with quinoa pilaf. It was delicious and super healthy! In a roasting pan, toss the fennel, shallots, garlic, tomatoes, thyme, 1/2 teaspoon of the salt, 1/4 teaspoon of the pepper, and the oil. Spread evenly and roast for 20 minutes. Move the vegetables towards the edges of the pan and place the salmon in the center; redistribute the vegetables around the salmon. Squeeze the lemon halves over the salmon. Sprinkle the salmon with the remaining salt and pepper. Return to oven and roast until the salmon is the same color throughout and flakes easily, 10 to 12 minutes (about 10 minutes for each inch of thickness). Serve immediately, with quinoa pilaf or rice. My grandfather, Alec, used to make this dish. I made it for dinner when we were up at my parents' place recently. Combine ingredients in a microwave-safe dish. Cook in microwave on full power, stirring every minute or so, until pink and just cooked through. I learned this basic risotto recipe in culinary school. You can leave out the salmon if you wish, and top with a little grated parmigiano reggiano. Bring stock to a simmer in a small saucepan. Heat oil in a heavy medium saucepan over medium-low heat. Add onion and sweat (do not brown) until translucent. Add the rice to the onions and oil, stirring well to coat rice grains. Do not allow the rice to brown. Add the wine and turn the heat up to medium, stirring until it is completely absorbed. Add the simmering stock, 1/2 cup at a time (using a ladle works well), stirring frequently. Wait until the stock is absorbed before adding the next 1/2 cup installment. When all the stock is incorporated (about 15-20 minutes), the rice should be tender but still al dente. Remove from heat. Stir in half-and-half and salmon. Stir in lemon juice. Garnish with herbs and serve immediately. Toasting and grinding cumin seeds is a bit more time-consuming than opening a jar, but it makes a big difference in the flavor. Grouper will also work well in this recipe. Cook cumin seeds in a skillet over medium heat 2 minutes or until fragrant and toasted. Place cumin, salt, and pepper in a spice or coffee grinder; process until finely ground. Rub cumin mixture over top and bottom sides of fillets. Heat oil in pan over medium-high heat. Add fillets; cook for 2 minutes on each side or until browned. Wrap handle of pan with foil. Bake at 375°F for 4 minutes or until fish flakes easily when tested with a fork. Sprinkle with parsley; serve with lemon wedges. In a small non-reactive skillet, bring the white wine to a simmer over moderate heat. Add the fresh salmon and simmer until it turns opaque, about 2 minutes. Using a slotted spoon, transfer the salmon to a plate and drain off the liquid in the pan. In the same skillet, melt the butter in the olive oil over low heat. Add the Cognac, smoked salmon and cooked fresh salmon. Simmer gently for 4 minutes, stirring with a wooden spoon to break up the fresh salmon. Remove the skillet from the heat. Stir in the crème fraîche until thoroughly incorporated. Season with salt and plenty of pepper. Scrape mixture into a small, deep terrine or ramekin. Cover and refrigerate for at least 24 hours and up to 5 days. Let the salmon pâté sit at room temperature for about an hour to soften slightly before serving. The pâté may be served from the terrine, or inverted onto a serving plate. Serve with toasted bread. Adapted from a recipe for Astier's Salmon Rillettes, by Food and Wine. Chilean Sea Bass is a wonderful fish on its own, simply grilled or broiled, with sea salt and black pepper. I was a little skeptical of dressing it up with a lot of strong flavors, because - as they say - why mess with a good thing? Let me tell you...this recipe is fantastic! Both my mom and my sister had made it before and recommended it, so I finally tried it. This is definitely going into my list of favorites! Serve with crusty bread to soak up the juices, and a nice glass of wine. Preheat an outdoor grill to medium-high, or position a rack in the center of the oven and preheat to 400°. Tear off 4 pieces of heavy-duty foil (or 1 piece to fit a baking sheet if you're using the oven) and brush with about 1 tablespoon extra-virgin olive oil total. Using the scallions and lemon slices, arrange a bed for each sea bass fillet on each piece of foil. Season the fillets all over with salt and pepper and set 1 on top of each bed. In a medium bowl, combine the tomatoes, anchovies, olives, capers, parsley, garlic, crushed red pepper and the remaining 2 tablespoons extra-virgin olive oil. Pile one-quarter of the sauce over each fish fillet. Top with another sheet of foil and pinch all the edges to seal, making a pouch. Place the fish pouches on the grill (or place the baking sheet in the oven) and cook for 17 minutes. Using a large spatula, lift the fish off the lemon slices and transfer to plates. Spoon the juices over the fish and serve with crusty bread and additional extra-virgin olive oil for dipping. This is a perfect meal for the summer. My husband and I had these fantastic fish tacos on Memorial Day with my Strawberry Summer Coolers. Christopher grilled the fish while I prepared the rest of the dish. I concocted the habanero sour cream on the fly, so the amounts may not be exact - just adjust to taste and you can't go wrong. Enjoy! Pre-heat grill to 500F, and scour grill surface with a wire brush. Season halibut with salt and pepper. Grill halibut for 10-15 minutes or until it flakes apart with a fork. Place on a serving plate and tent with aluminum foil. Cut avocado in half and remove pit. Score 1/2" cuts into the flesh without cutting through the skin; scoop out into a bowl. Add lime juice, cilantro, and several generous splashes of green Tabasco sauce. Stir to combine. Set aside. Mix together all ingredients for habanero sour cream. Add as much habanero Tabasco sauce as you like, for the spiciness factor. Adjust flavors to taste if desired. Prepare individual bowls of the garnishes - cabbage, tomatoes, limes, and cilantro. Set out the halibut, avocado salsa, habanero sour cream, and condiments. Allow people to build their own tacos as they like. The tropical flavors of the lime and cilantro dressing, and of the fresh mango, are wonderful complements to seared sushi-grade tuna. My husband described this dish as "the perfect meal" and "orgasmic" - but don't take his word for it, try it for yourself! Combine dressing in a small bowl. Heat oil in a large skillet over medium-high heat. Season tuna with Kosher salt and freshly ground pepper. Sear tuna, leaving it rare inside, until well-browned and easily releases from pan - about 2 minutes per side. Transfer to a cutting board and slice thinly. Mound greens and onion on each plate; season with salt and pepper. Top with sliced tuna and diced mango. Drizzle with dressing. Garnish with pickled ginger. Serve immediately. My husband and I love sea bass, so I adapted this recipe to make use of some canned pineapple rings I had in my pantry. I served this fish with steamed vegetables and brown rice, and piña coladas. Great for summer! Place pineapple rings in a blender or food processor and pulse until pineapple is pulpy. Place pineapple pulp in a small sauce pan; add juice from pineapple can, vinegar, basil, garlic, sambal oelek (if using), chili sauce (if using), and soy sauce. Heat until simmering; continue cooking until reduced to a thick sauce. Season to taste by adjusting any of the sauce ingredients. Remove from heat. Spray a piece of aluminum foil with non-stick spray; place fish on foil, skin side down. Season with salt and pepper. Broil fish for 5 minutes. Remove from oven and spoon sauce over top (some sauce will be left over). Return to broil for an additional 5 minutes, or until the fish flakes easily with a fork. Serve with remaining sauce, vegetables, and rice. Serve with jasmine rice for an easy, healthy, authentic Thai meal. Place tamarind pulp or concentrate in a small bowl with 1/2 cup water. Let stand 20 minutes. If using pulp, strain off liquid and discard solids. Heat oil in a wok or frying pan over high heat. Add lemon grass (or lemon rind) and chiles; stir-fry for 1 minute. Add shrimp to pan and continue to stir-fry for 2 minutes more, or until the shrimp changes color. Add mangoes, cilantro, sugar, lime juice and tamarind liquid. Continue cooking for 5 minutes longer, or until the shrimp cooks completely. Our spring break in Belize inspired me to make this delicious dish. We had ceviche (pronounced seh-VEE-chay) everyday in Belize - sometimes for both lunch and dinner! It can be made from shrimp, lobster, conch, or other types of fish. Often the fish is used raw, as the lime and lemon juice "cooks" the fish meat - it turns firm and opaque. For this recipe I blanch the shrimp in boiling water, shock it in an ice water bath, and then proceed with the marinating. Enjoy! In a large pot, bring to a boil 4 quarts of water and 2 Tbsp salt. Add the shrimp and cook for 1 minute to 2 minutes MAXIMUM. Do not overcook or it will be rubbery. Drain shrimp and immediately place into a bowl of ice water to stop the cooking. Drain shrimp from cold water. Cut each piece into quarters. Place shrimp in a glass or ceramic bowl; add lime and lemon juice, stirring to combine. Cover and refrigerate for 30 minutes. Add onion, jalapeño, tomato and cucumber to shrimp, stirring to combine. Cover and refrigerate for another 30 minutes. Just before serving, add the cilantro and avocado. Season with salt to taste. Serve with tortilla chips. Combine orzo, cucumber, green onions, and tomatoes in a large bowl. Place dill, vinegar, and mustard in a blender and blend until smooth. With the motor running, slowly add the olive oil and blend until emulsified. Season with salt and pepper, to taste. Pour the vinaigrette over the orzo mixture and stir well to combine. Gently fold in most of the feta cheese, reserving some for garnishing. Thread the shrimp onto skewers. Brush shrimp with oil and season with salt and pepper. Grill for 2 minutes per side, or until just cooked through. Remove to a clean platter, and remove from skewers. Divide orzo salad among 4 plates and top each portion with shrimp. Garnish with additional feta cheese and fresh dill. Recipe courtesy Bobby Flay on FoodNetwork. 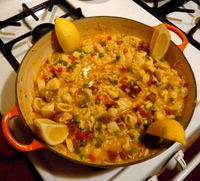 I created this recipe after taking a seafood cooking class at Coastal Seafoods. This is perfect on a warm summer night with a side of couscous or rice pilaf, and a simple green salad. Note: tuna should be rare (pink) inside. Mix marinade together in a bowl. Reserve 1/4 cup of marinade in a separate container. Place tuna and marinade in a zip-top plastic bag. During the last 15-20 minutes of marinating preheat grill to medium-high heat. Remove tuna and discard marinade. Grill tuna for 2 minutes on each of the 4 sides.